Blind Man Drivin’ starts off Six String Soldier, an intense track that brings equal amount Santana-esque guitars, blues, and lounge music together with flair and raw skill. The amount of narrative that Stuckey’s guitar brings to the mix cannot be ignored; the different nods to The Dools and Jimi Hendrix make this opening one of the more memorable we’ve experienced. All Roads Lead To A Broken Heart slows things up and brings Stuckey’s voice into the fore. The track links together 1970s rock with country and western to create something from the heart. Of particular note during this single has to be the chunky bass lines and gradual uptick in momentum that listeners will experience as they move into the cut’s chorus. Another Girl changes up things considerably with the inclusion of a secondary set of vocals. Stuckey’s performance here draws upon the rich musical tradition of ZZ Top and Tom Petty, peppering the track with heavy, sizzling guitar licks. 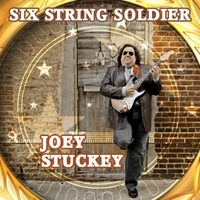 The guitar’s role here continually changes as Stuckey shifts through styles and influences, giving Six String Soldier a shot in the arm. Lover’s Ride is the penultimate effort on Six String Soldier, marking another line crossed when the instrumentation comes out as more intricate and dense than any other song previously heard on the album. Taken together with the ballad Mr Mooney, Lover’s Ride represents a set of diametrically opposed compositions. The distance that exists between these two efforts is substantial, a further indicator that Joey Stuckey is a complex musician. At all points during his latest album, Stuckey is able to make this massive amount of influences work to create a cogent release. Six String Soldier is a must-buy.